In the bathroom cameras case, part of the reason the judge granted an injunction against the facility using the cameras was because they didn't help stop unwanted activity (multiple people going into the bathroom at one time). He said: "Although unmonitored cameras may sometimes deter illicit behavior and help with investigations, they do not provide the administrators with immediate alerts concerning patient safety or directly prevent assaults or dangerous acts. Could people counting analytics have solved this problem? 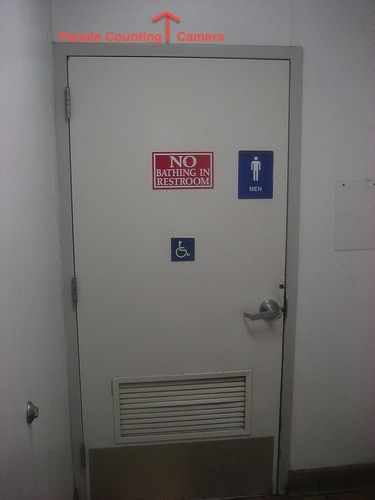 Would there be a way to set cameras to alert when more than one person went in the bathroom at one time? I actually do think the burden in this case falls on the administrators of the video surveillance system. Video analytics, depending on which, do require tweaking regarding object size (large person vs. two people or one person with a backpack) and when alerts should be triggered. It all comes down to being proactive, doesn't it? I would prefer to receive false positives rather than not get notified at all in some cases. False positives, when analyzed properly, should help to determine how to further tweak the settings. Overall this is largely a huge time investment upfront to set the FOV and analytics properly that can pay great dividends in the future. I assume there are some people counting systems that can set up rules / alerts for tracking in and out. If the number of people in exceeds 1, generate an alert, send an email, etc. The good thing here is that it's got to be low traffic in that area so that makes it easier. Main risk is if a person tried to sneak in, go from the side, etc., that might cause a missed count. John, do you mean from the side of the frame? Ah, this would be an issue of bad design and installation on the installers part. FOV, analytics and surveillance in general should take into account ALL the ways in which an object may enter a scene. It could drastically alter the analytics and proactive vs. reactive approach. P.S. and some locations may require multiple cameras or special cameras for the area such as panoramic or 360 fish eye views. Mobotix has people counting built in, for free, on their panoramics (Q24). The main question would be - Can you capture/count someone who tries to sneak in from the left or right side of the door? Great idea! There are stereovision units (such as those used in the headers of revolving doors) that are designed specifically for this purpose to detect piggybackers. Some years ago, i used one time (don't recall the name) for an interlock door system into a server farm. The thing took some tweaking, but it eventually worked out. Been in use now for about 10 years. I also recall an analytic rule back in the early days of analytics that would alarm whenever fast motion would be detected. As I recall, it was designed specifically for detecting fights. The other problem is that this solution assumes there is someone to monitor the "area of interest". Not sure if that is the case here. Ah, I get what you're saying John. I was thinking it could be mounted opposite the door, facing the door. Would that still work? I guess the downside would be you would get the back of their head instead of their face. But you'd get their face coming out.